Over the past two years The Cyprus Institute and colleagues from the BeWater Project have organised a number of stakeholder meetings and events to identify options to adapt the Pedieos River Basin to climate change. Ten water management options were selected to protect the downstream urban against flooding. These ten options were explained on two large BeWater banners. Even though the river wasn't flowing, many visitors remembered last year's storm event, which flooded parts of the cycling path. Most people were happy to be given the opportunity to review and score the ten water management options. A total of 84 questionnaires were filled out, both by women (56%) and by men (44%). Restoration and maintenance of the riverbed is the most important water management option, according to the park visitors. Improvement of land zonation to prevent construction near the river and the protection of the upstream forest against fires received the next highest scores. The construction of flood protection works was the least popular option. Nevertheless, the average score of all ten options ranged between "important" and "very important" for the sustainable management of the river basin. The BeWater banners and 1-page survey provided an attractive way to capture the attention and interest of the park visitors. 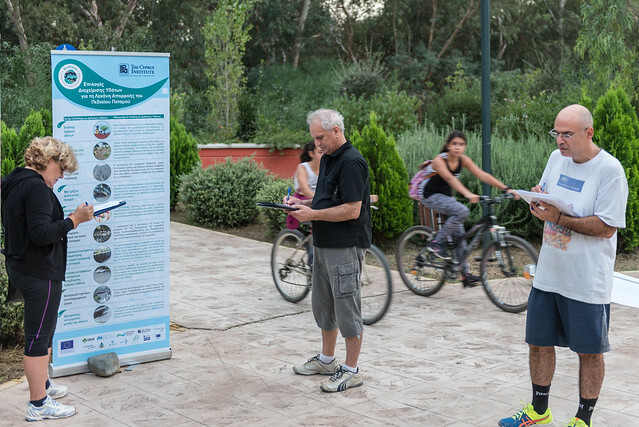 The Cyprus Institute’s researchers also enjoyed their evening in the park and the opportunity to talk to so many people about climate change adaptation.